Just published a couple days ago, this addresses the challenge of needing technical documentation around how to deploy Office 365 Professional Plus using SCCM 2012 R2. 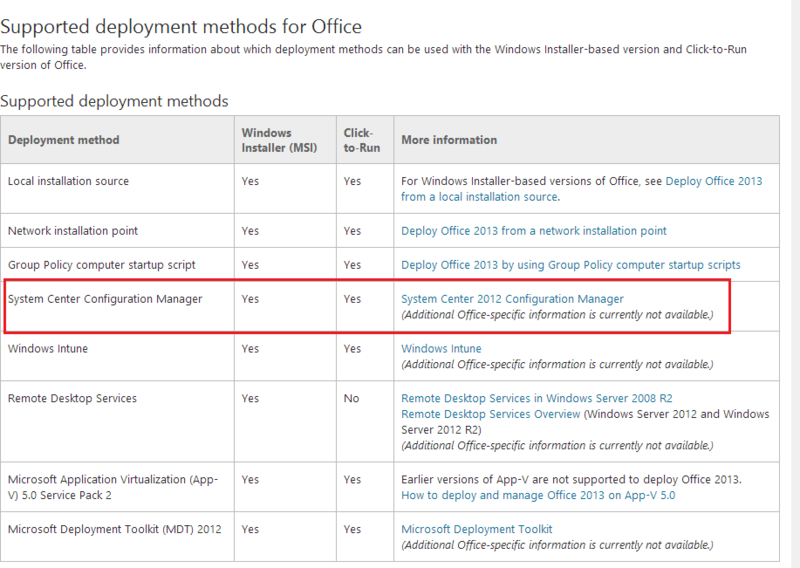 If you use System Center Configuration Manager to deploy software, such as Office, to users and computers in your organization, you can also use that existing Configuration Manager environment to deploy Office 365 ProPlus. By using Configuration Manager, you can control which users and computers get Office 365 ProPlus, where they get the installation files from, and when the Office 365 ProPlus installation occurs. For example, you can control network bandwidth usage by placing the Office 365 ProPlus installation files on a distribution point within your organization’s network, instead of having users install Office 365 ProPlus directly from the Internet. Keep in mind, however, that even if you’re installing Office 365 ProPlus from a location within your network, the computer where Office 365 ProPlus is installed still needs access to the Internet to be able to activate Office 365 ProPlus. The steps that follow are for System Center 2012 R2 Configuration Manager, but you can also deploy Office 365 ProPlus by using System Center 2012 Configuration Manager or Configuration Manager 2007 R2.